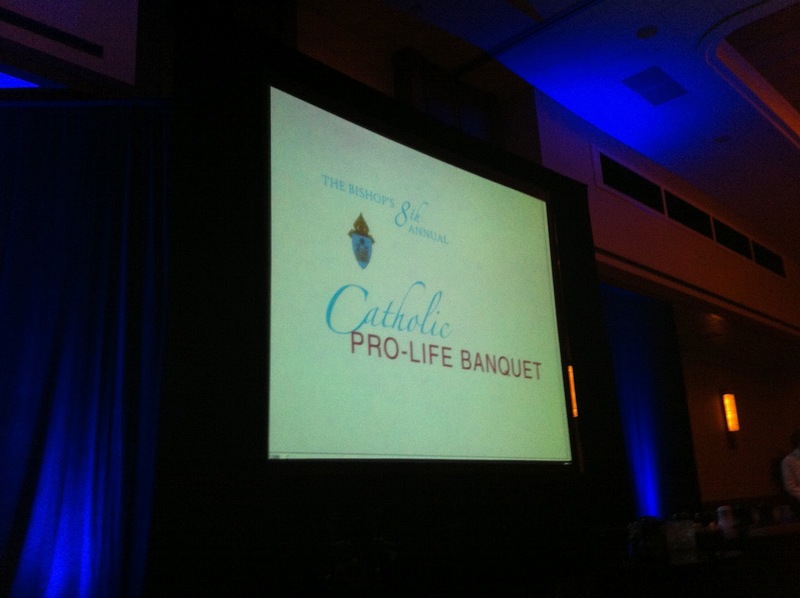 This evening I had the awesome opportunity to attend the Bishop’s 8th Annual Pro-Life Banquet. The funny thing is… I originally wanted to go until I found out that the date conflicted with another Catholic event I frequent (The Shepherd’s Cafe)….on top of that, today is also the first marching competition for my high school band, of which I’m currently an active volunteer for when I’m not volunteering at my parish. I was conflicted up until a week ago on which of the three events I would attend…like, I wish I could tri-locate. But, I guess God really wanted me to be at the banquet because one of the adults from our Respect Life committee approached me randomly last week offering me a seat at his table for the banquet. Apparently, one of our resident Hispanic sisters at our parish wouldn’t be able to attend, so I was invited to take her place. And I did. And I’m grateful for the opportunity! I’ve never been to the Bishop’s Pro-Life Banquet before so this was all new to me. My first observation upon arriving was…that it felt weird coming to the Hyatt Regency at D/FW Airport for a Catholic event that wasn’t DCYC. The only other times I’ve been to this venue was for DCYC. I mean, the same large room was used, but set up for dinner. Same base level used. But instead of a bunch of Catholic youth running around to different booths in the lobby of the base level, there were a bunch of adults dressed nicely carrying adult beverages (definitely not a youth event, haha). My second observation was that yes, there were youth running about–youth from my parish! Since a good handful of them are part of our diocese’s Youth For Life organization, they were enlisted to help out in various capacities for tonight’s banquet. Small Catholic world. Wasn’t expecting to see them. I got to mingle around with other adults from my parish. Yes, with red wine (praise God I’m Catholic!). After some mingling and brief looking around at the silent auction, I sat down at my table. The crazy part about my table is that…it included my pastor and his wife (he’s an Episcopalian convert), Bishop Vann was at a table next ours, and right behind me was the stage. Cool! To get the night started, John Rhadigan of local sportscasting fame, provided his master of ceremony services. Yes, he sas giving some Rangers updates throughout the night. He apparently is a TV anchor for FSN and has done some other sports host-related jobs. Cool stuff. During dinner, they had musical entertainment involving a piano player and later a mariachi band! I approve, being the band nerd that I am. It was kind of funny because Bishop Vann finished his dinner rather quickly only to get up and be a social butterfly in talking to the many people in attendance during dinner. 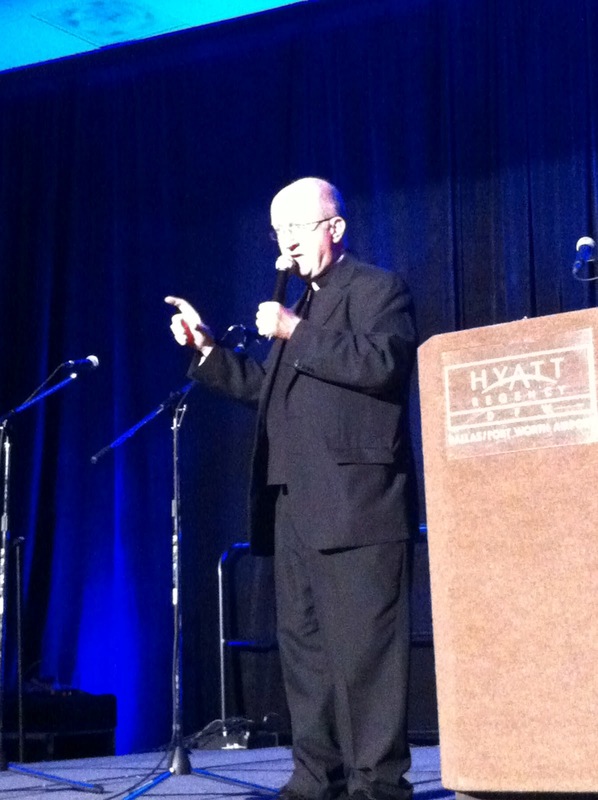 John Rhadigan came up again after dinner to introduce Fr. Jim Pemberton of St. Bartholomew’s in south Ft. Worth. He provided some humor with stories and then started going on about how we must be the light in the darkness in regards to the culture of death that we currently live in. For added effect, when he talked about darkness, they actually dimmed the lights. He brought up Bishop Vann to speak and he reiterated being a light in the darkness, and Bishop talked about his reassignment to Orange County, CA. 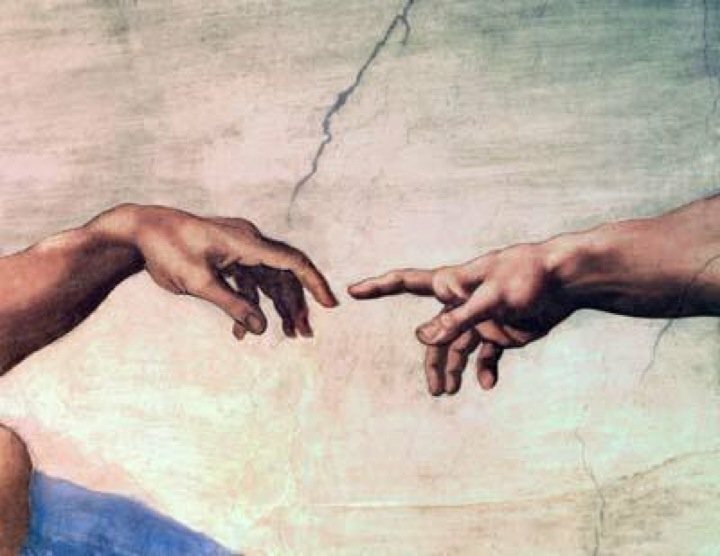 …this is from the Sistine Chapel where God (right) is reaching out to Adam (left). But the picture auctioned off has a baby fetus on the left, with God reaching out with His finger. Cool. There was a local Catholic painter who donated this beautiful crucifix that he painted in a particular Byzantine style to be auctioned off. And he also painted a huuuuuuuge painting of the Annunciation not based on any particular style but his own. Beautiful pieces of art, but I didn’t take pictures because…I was front row and that would have been awkward. Next up was a video presentation from the Youth for Life. I think all but one of the youth giving interviews were from my parish. A lot of them talked about their Pro-Life Boot Camp from the past summer and the importance of being pro-life. That was really cool to see. I love seeing my parish represented through the witness of our youth taking action in the greater Church. After them, John Rhadigan had our keynote speaker come up. Dr. Thomas Hilgers is a ob/gyn who discovered, researched, developed, and promoted NaPro Techonology, which is a method in addressing women’s reproductive health by getting to the root of the problem rather than putting a band aid on women’s health issues through prescribing the birth control pill and other such negative solutions. He’s also the founder of the Pope Paul VI Institute where they research reproductive health solutions and teach medical professionals how to be Catholic doctors as well as educate women on how to utilize their fertility services. Dr. Hilgers explained his story of how he got into being a doctor specializing in women’s reproductive health from a Catholic perspective. I think the essence of his talk was that to be pro-life, we have to remember that fertility treatments like in-vitro fertilization results in the death of many embryos before a successful pregnancy occurs. And that the solution to many women’s reproductive and fertility issues can be solved via the methods that he has researched and practices (particularly NaPro and Creighton model). He covered a lot, including statistical information. In addition, he touched on faith and science because those two things seemingly contradict each other, but to be Catholic is to be a lover of faith and reason/science. One thing I found surprising is that he mentioned that the American College of Obstetricians and Gynecologists is pro-contraception, pro-abortion, etc. You would think that people in that profession would be more open to other ideas besides those that harm a woman’s health…but…that’s just the crazy world we live in. Following Dr. Hilgers, Bishop Vann came up to wrap it all up. He awarded a couple from our parish due to their dedication to the pro-life cause in our diocese. Very cool. Raffle tickets pulled by seminarians. Closing prayer by a priest. More mingling afterwards. Then, I went home. All in all, a good night. I’m grateful that I went. Bonus points because I got some free Catholic swag (a book on St. Therese by Archbishop Fulton Sheen, and some other literature) and the opportunity to see my parish family at this event. Tonight just reaffirms my commitment to my own pro-life efforts, especially since we’re in the middle of a 40 Days for Life campaign. Also, this deserves a future blog post but also a lot of research to in order to give it the justice it deserves…but…I think the other takeaway tonight is the Catholic response to the attacks on faith and reason and women’s health. Because…there are people out there who say Science >>> Faith and that the Catholic Church hates women and the Church is but an obstacle to women’s health. But with the work that Dr. Hilger’s does…it just blows those arguments outa the water. Like, boom roasted.